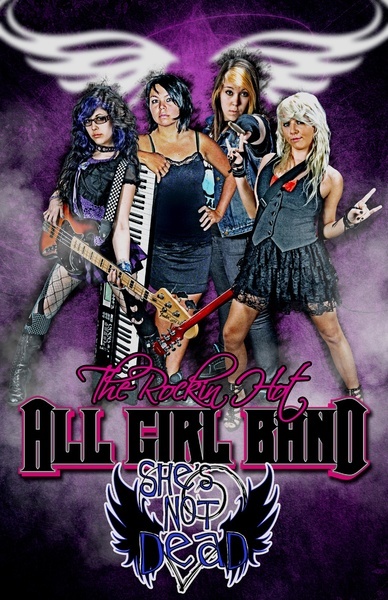 She’s Not Dead are a young & explosive All Girl Band from Portland Oregon and they will fill your ears with excitement! Playing a mix of Hard rock, Pop with a touch of Punk they’ve created a sound all their own. Because of their wild female members, they definitely stand out from all the guy bands out there! With lead singer Kira Nesser fronting the band with her guitar strapped on like a weapon of youthful glory, there will be no doubt that something exciting is happening here. Kira is backed by a band filled with spirited and authentic female musicians, who with unbridled enthusiasm help fill these songs with youthful frenzy and emotion. Don’t be surprised if you find yourself shouting and singing along with their songs even after your first listen.